Since I mentioned one of my favorite ETP sites earlier today [the more I think about it, the more I have come around to the idea that the Best Post of the Year on Exchange-Traded Products may be the best post I have ever seen on the subject] I thought it might be a good idea to include some functionality with that required weekend reading. 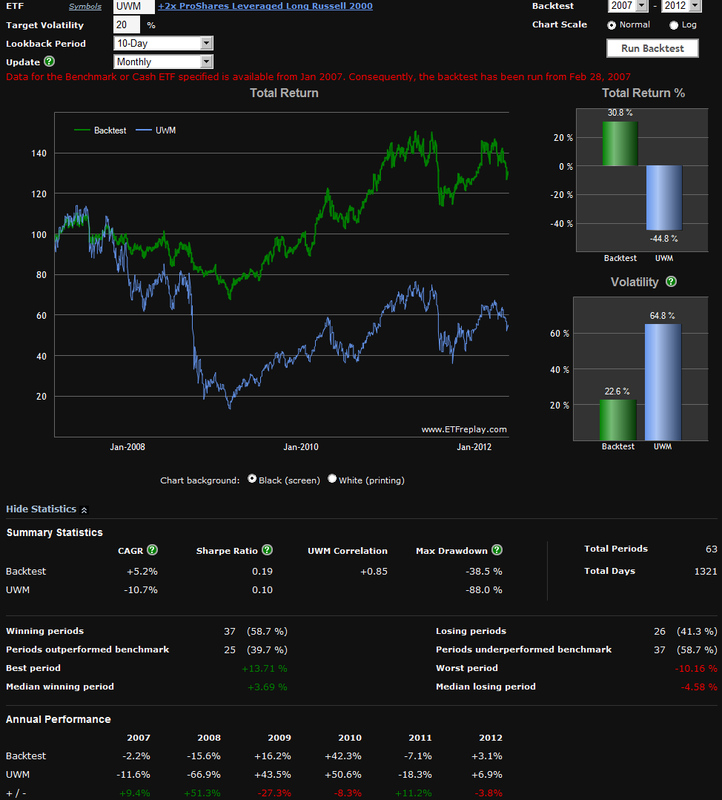 Another superb ETP site, ETFreplay.com, recently launched a Volatility Target Backtest tool. 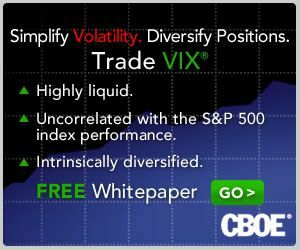 What this tool is designed to do is to demonstrate what historical returns would have looked like if one had taken a high volatility ETP such as a leveraged ETP, a VIX-based ETP, etc. and combined with a dynamic cash allocation and historical volatility data to limit exposure to a target volatility ceiling. An example may make this easier to visualize. Let’s assume that you are bullish on the Russell 2000 index of small capitalization stocks and want to get some long exposure to these stocks with the +2x leveraged ETP, ProShares Ultra Russell2000 (UWM). Last August, however, the 10-day historical volatility in UWM spiked over 160 and right now it is at 41 – and you decide those levels of volatility are unacceptable, particularly with all the uncertainty in Greece and across the euro zone. The solution? How about a portfolio that dynamically allocates between UWM and cash, (here using the iShares Barclays 1-3 Year Treasury Bond, SHY), based on 10-day historical volatility data and targets a forward volatility level of 20%. The graphic below shows the ETFreplay backtest results of such a portfolio, using a monthly rebalancing period and starting in January 2007, when UWM was launched. Of course past results are no guarantee of how this type of strategy might work in the future (and leveraged ETPs certainly entail a great deal of compounding decay risk for long-term investors), but the graphic is compelling, for both bull and bear markets. Think of this type of approach as a way to fine-tune risky products to a desired volatility level. Enjoy the long weekend, everyone!